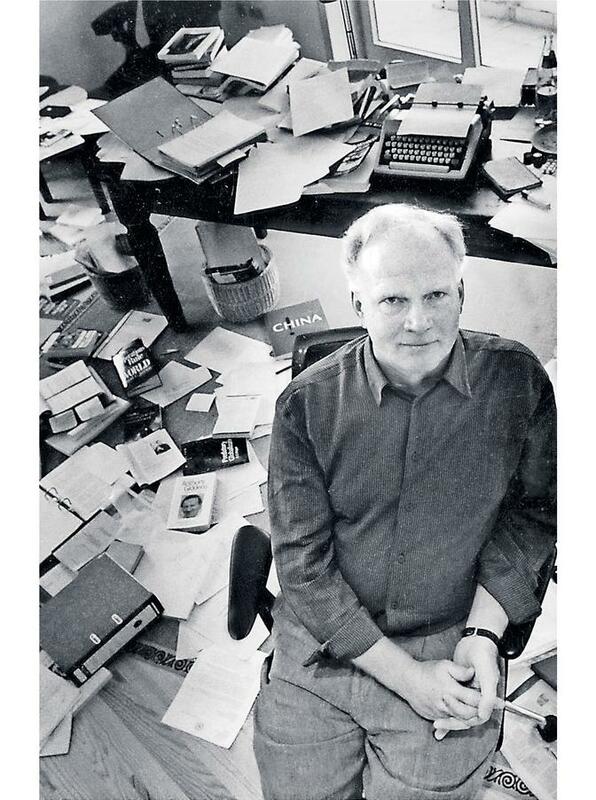 We are deeply concerned to hear that German sociologist and author of the Risk Society, Ulrich Beck passed away on January 1st. The global sociology community in general and the Cosmobilities Network has lost a public intellectual, a singular free mind, constant inspiration, a challenging voice and unique political figure in science and society. 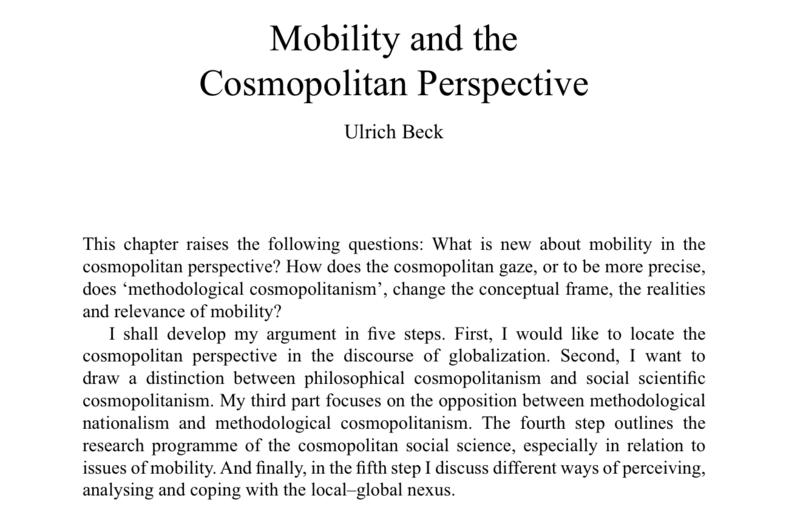 In his writings and social commitment Ulrich was fighting for cosmopolitan mobilities and a world where mobility wouldn’t be a threat but a blessing. He was fully aware of all risks and dangers for modern lives. But he never lost his optimism for a better world and another, a reflexive modernity where people meet and interact with each other instead of being xenophobic and destructive in competition. We are deeply concerned about his death and feel with his family and friends. Mobility and the Cosmopolitan Perspective will live on in our network and future. 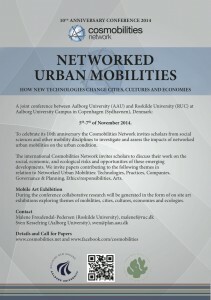 Calls for papers to special sessions at the Networked Urban Mobilities Conference 2014 are open. We are very happy to invite abstracts for the following 8 special sessions before the 28th of may. In recent years, it has been argued that new research methods are needed to study current mobility practices, discourses and materialities. Next to more traditional social science methods, mobile methods have included participatory observation, virtual and autoethnographies, and various kinds of mapping. Building on these methodological innovations, this session theme explores art as mobile research. Since the early 1990s, artistic research has developed as a distinct field of study. Making art is taken to be a form of doing research and the works of art that result from that research are presented as a form of knowledge. Practical testing is frequently an essential part of this ‘journey of making’ process, enabling ideas and techniques to be resolved before making finished work as part of the whole creative process. Art is not only relevant from the perspective of the aesthetic experience, it is argued, but also as knowledge claim. For artistic practice, this development undermines the modern dichotomy of autonomy and instrumentalism, thus breaking away from the alleged ‘otherness’ of art as a societal domain that has clear boundaries and can be separated from science. In this session, we investigate how art practices might contribute to mobilities research, as well as how artists reflect on mobile worlds in their work. How can artistic research practices and discourses be drawn upon to develop new ways of understanding and researching the performative ontologies of travel? How can artistic production be seen as a meaningful context to explore mobilities? How can the creative process of the ‘journey of making’ inform mobilities? We invite papers and art works examining these questions. The session will be organizaed by Kevin Hannam from Leeds Metropolitan University and Peter Peters from Maastricht University. Please, submit your abstract of no more than 300 words no later than May 28th to Kevin Hannam at k.m.hannam@leedsmet.ac.uk or Peter Peters at p.peters@maastrichtuniversity.nl. Since its inception, urban theory has been grounded in the basic assumption that urban phenomena are produced in cities. Cities, meanwhile, are constructed as qualitatively distinct, nodal and bounded sociospatial settlement spaces, discursively constructed in opposition to the “non-urban” spaces of the suburbs, rural communities, “remote” regions (i.e. the Arctic) and so on. In his recent work, Neil Brenner (2013) questions such accepted understandings and argues instead for new urban epistemology that embodies “urban theory without an outside”. Mobilities research has much to contribute to this pivotal new framing of urbanization by drawing our attention to the ways in which broad constellations of urban relationships are produced through diverse relationships between people and places across time and space. In particular, attention to role of mobilities allows for the examination of diverse forms of linkage—economic, cultural, social, institutional, colonial, and so on—in the (re)production of these expansive urban meshes. In this session, papers are invited that broadly explore the dynamics of mobility and urbanization in ways that aim to conceptually supersede the persistent non-urban/urban divide in urban studies. In particular, these papers will seek to contribute to a conceptualization of urban forms and processes as multiscalar, diffuse, and enmeshed in complex and context-dependent (economic, social, cultural, infrastructural, institution) entanglements that extend well beyond cities as sites of agglomeration and accumulation. Papers that empirically examine the role of mobilities in urban forms, processes and transformations outside commonly accepted urban locales—i.e. the Arctic, the Amazon, the Oceans—are especially welcome. Moreover, papers that draw from diverse methodologies (social science, literary, audio, visual) are also most welcome. The session will be organized by Julia Christensen from Roskilde University. Please send your abstracts of no more than 300 (and/or any questions, comments, or concerns) no later than May 28th to Julia Christensen at juliac@ruc.dk. Based on innovation theory the case of electric mobility in networked urban environments leads to the hypothesis of converging and intertwining two sociotechnical transitions: the transition towards renewable energy systems and the transition from combustion engine based transportation to elec- tric vehicle systems. In this innovation context a question arises: what is the impact of regime con- vergence in the innovation process? Comparative international case studies can help to deepen this aspect. Both chances and obstacles should come into focus of the session. The e-mobility hype seems to be over. But the energy transition from fossil resources to renewable energies got a huge momentum. Established structures in energy production and consumption erode and boundaries blur. The so called “prosumer” came into the game as a new actor. The more renewable energies will be installed the more storage capacities and demand side man- agement are requested. The question is, whether the mobility sector can develop from an energy consumer to an energy storage component and potentially even become an energy provider. A promising way can be running cars under control of fleet managers as rental cars – especially as car- sharing cars as elements of intermodal services. This would have a technical dimension: norms and standardization of technical interfaces and protocols will become more relevant in a networked and decentralized energy world. Access and loading procedures must be user-friendly. This also has a strong social and economic dimension: what are potential businesses cases of “renewable e- mobility” and their acceptance? In the consequence of growing fleet based e-mobility the dominance of private car model starts to crumble. The session will be held by Weert Canzler and Andreas Knie from Berlin Social Science Centre (WZB). Please send your abstract of no more than 300 words no later than May 28th to weert.canzler@wzb.eu. Methodological and ethical challenges to document, assess and visualize artists’ mobilities on a quantitative level. The session focuses on structural, policy-related and conceptual issues related to artists’ mobility rather than on mobility as a theme of art works, art criticism and cultural theory. The session is intended to serve as a meeting place for cultural policy practitioners and scholars who want to discuss past and present projects on the above mentioned issues and/or seek possible future collaborations across disciplines and sectors. As Cosmobilities is a voluntary research network with limited funds, please note that we cannot subsidize travel and accommodation costs. Convener: Anna Lipphardt from RG Cultures of Mobility in Europe at Universität Freiburg. Please send your abstract (300-400 words) and a short CV no later than May 28th to Anna Lipphardt at anna.lipphardt@eu-ethno.uni-freiburg.de. Today, cities and regions are increasingly struggling with risks and uncertainties. Simple certainties and securities for planning the future of the urban and regional settlements have been lost and the reflexive modernization of planning and policy making is progressing fast (Beck 1992, Hajer 2009, Healey 2001). Urban stakeholders and planners are facing risks and challenges endangering the fundaments of urban systems and the living conditions of urban societies and economies. At the same time, the rate of urbanisation is accelerating, particular in growing economies. How to influence the sustainability and liveability of urban regions for future generations is the overarching question of the 21st century, not at least against the background of growing relevance of megacities and splintering urbanism. On-going economic crises, the side effects of perpetual growth, ecological problems, splintering urbanism, infrastructure capacity, global competition, social disintegration and criminality push economic, social, health and infrastructural systems to the limits. To complicate matters further, urban systems and society at large are growing increasingly complex, and conventional planning tools are often ill- equiped at handling the resulting uncertainty that this introduces in predictive analyses (Taleb, 2007). This produces a situation where urban planning and innovative ways of policy and decision- making become vital for the future of the urban condition. The mobilities of people, artifacts, goods, knowledge, data and information, waste and resources are fundamental for the future of the urban. Cities are living bodies where multiple flows stream in and out (Ritzer 2010). In a general sense, sustainable urban ‘mobility management’ is an elementary and constitutive need and a strategy for the future of urban regions and living conditions. The session will be organized by Morten Skou Nicolaisen and Sven Kesselring, from Aalborg University. Please submit abstracts of no more than 300 words no later than May 28th to Sven Kesselring at sven@plan.aau.dk. The session theme, Cycling Futures reflects a core question posed in the Cycling and Society volume that was a product of the very first CSRG meeting, and the session is intended to link cycling studies more closely with other elements of current mobilities research. While there is a rapidly growing literature on current practices and behaviours, this session invites analyses that go beyond the reporting of findings and explore the potentials and problems that accompany the diverse practices that constitute the many forms of cycle mobility. We seek to present a range of studies that consider not just what is, but what might be? How do the various cultures and subcultures presented in recent studies interconnect and interact with each other and with wider mobility practices. To what extent does cycling today still reflect cycling a century ago, and what might cycling practices 50 years hence look like as part of broader sustainability practices. What can change, what may need to change if cycling is to become the default urban mobility choice? We invite papers on practices of cycling, examining intersections of meanings, technologies and competencies and their place both in changing current urban milieux and in anticipating low-carbon futures. While looking ahead is core to the vision of the session, we also recognise the need to look back at prior historical cases of mobility transitions to understand better the forces and effects involved. We would particularly welcome contributions that engage with some of the questions posed in Cycling and Society. What role for cycling in the ‘post-car’ future? What will future cyclings look like? To what kind of societies will those cyclings contribute? How prominent a part can it play in an increasingly global, increasingly mobile world? Please submit your abstract of no more than 300 words no later than May 28th to Peter Cox at peter.cox@chester.ac.uk. Today, corporate mobility, business travel, and mobile work are in a process of fundamental transformation. The normalization and rationalization of corporate mobilities and the time- space-compression of everyday business practice shape the relations of mobility and power. Social science has largely neglected the topic of spatial mobility. Dealings with distance and travel, however, are driving forces for the modernization of modern societies and urban environemnts. They indicate the networked character of economic activities of companies, business travellers and industries at large. Economic activity is based on mobility and companies deploy sophisticated mobility regimes to be present in markets. The increase in mobile work brings new issues centre stage such as the control of mobile workers, social cohesion, and the spatial complexity of corporate activities. Mobile work and business travel are signifiers for social change in the organization of work. The session will be organized by James Wickham from Trinity College Dublin and Sven Kesselring from Aalborg University. Please submit abstracts of no more than 300 words no later than 28th of May to Sven Kesselring at sven@plan.aau.dk. This special session investigates research on physical and virtual mobilities’ influence on everyday life, generating descriptive accounts and novel theoretical concepts about practices, cultures, communities etc. within understandings of mobilities and urban life. Mobilities are experienced through bodies interacting with mobile technologies weaving themselves into the fabric of everyday life until they are indistinguishable from it. These embodied mobilities are often practiced non-reflected but yet with fully felled and realized sensations, moods and affects. Everyday life should not be understood as isolated units when it is constantly challenged and influenced by the multi-scale character of social praxis, identity formation and social processes. The basis in everyday lives reveals that which creates meaning and significance – why things matter to people – and thus also how, through their praxis, they shape societal institutions. Form: The intend of the special session is to integrate all papers in an open discussion conceptualizing embodied mobility practices in everyday life through common-developed metaphors. Contributors are therefore asked to participate in the informal debate generating fruitful ways of describing the interconnectedness between mobility practices and everyday life. The session will be organized by Katrine Hartmann-Petersen and Malene Freudendal-Pedersen from Roskilde University. Please submit abstracts of no more than 300 words no later than 28th of May to Katrine Hartmann-Petersen at katrineh@ruc.dk or Malene Freudendal-Petersen at malenef@ruc.dk. To make cities places of lived social, economic and ecological sustainability, it needs strong and socially inclusive mobility systems. 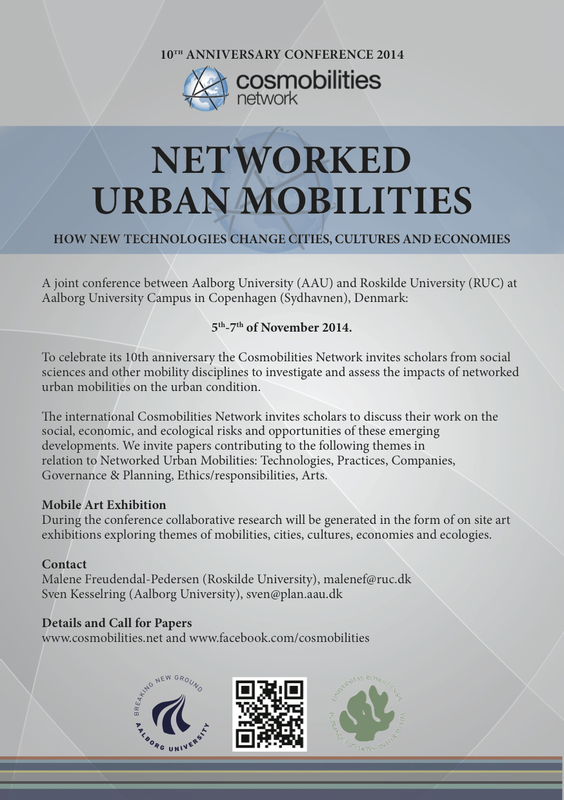 To celebrate its 10th anniversary the Cosmobilities Network invites scholars from social sciences and other mobility relevant disciplines to investigate and assess the impacts of networked urban mobilities on the urban condition. Cities and regions are constituted by complex settings of social, technological, geographical, cultural, and digital networks of mobility (Graham, Marvin 2009). The urban scale is an essential part of the global ‘network society’ (Castells 1996) with new forms of social and cultural life emerging and with strong impacts on the ecological conditions. The great crash from 2007-8 onwards, means that future mobilities are going to be developing in a resource-constrained world. Excessively consuming infrastructural developments are highly risky for the future of modern societies. Thus, innovation in policies, products, services, and technologies is needed to tackle climate change and increasing urban social and economic challenges. An approach is required which bridges research disciplines and analyses societal consequences of path dependencies, funding decisions and technology policies. When mobility is made plural and becomes mobilities it stems from the newly emerging field of interdisciplinary Mobilities research (Urry, Sheller 2006; Canzler, Kaufmann, Kesselring 2008; Grieco, Urry 2012). The concept of ‘mobilities’ (Urry 2000) encompasses the large-scale movements of people, goods, capital, and information, as well as the more local processes of daily transportation, communication and the travel of artefacts. These different mobilities are considered fundamental in framing modern social life and urban cultures in particular. All this demands better theory and empirical research to examine the interdependencies between changes in physical movement, electronic communication and their increasing convergence and potential substitution of travel and transport. Against this background, the international Cosmobilities Network invites researchers and scholars to celebrate its anniversary and discuss their work on the social, economic, and ecological risks and opportunities of these emerging developments. The conference addresses these challenges and calls for the exchange of ideas on how to significantly improve the conditions for life in urban spaces. Technologies: ‘Seamless mobility’ is a historically grown vision held by architects, planners, and engineers. Optimizing city spaces for the mobility of people, vehicles, goods and so on, with minimum loss of time and energy, has mobilized innovation, capital and entrepreneurial capacities. Practices: Networked urban mobility infrastructures enable and limit everyday mobile practices of people at the same time. Based upon advanced mobile devices, people can manage complex arrangements of socio-spatial organization, scheduling, and negotiations. Companies: For the sustainability of urban mobilities modification within companies are a key issue. The rise of the Internet and the spread of mobile computers and mobile phones, as well as recent developments such as Cloud computing have been mobilizing businesses in a way not imaginable only some years ago. Governance & Planning: The need for sustainable mobilities in urban environments pressures urban politics. ‘Reflexive governance’ and the capacity to allocate expertise and knowledge at the right place and to the right time, is prerequisite for developing non-destructive future-oriented strategies for low carbon and socially inclusive mobilities. Ethics/responsibilities: Considerations and systematic analysis of the ethical implication of mobility solutions is a research deficit. I.e. overcoming automobility and car-dependency in the Western societies without offering alternative ways of transport in rural areas. Or the use of ICT’s both in mobility research in form of mobile methods and in the application of mobility solutions such as Intelligent Transport Systems highlights problems of surveillance and privacy. Arts: Art is yet another point of departure for the Cosmobilities Network towards a transdisciplinary perspective in Mobilities research. We explicitly call for artistic contributions on mobility from fine arts, music, film, writing, performance arts etc. Energy Transition and E-mobility: a Chance for Convergence? Abstracts of no more than 300 words should be submitted to Malene Freudendal-Pedersen (Roskilde University), malenef@ruc.dk or Sven Kesselring (Aalborg University), sven@plan.aau.dk no later than the 28th of May 2014. Malene Freudendal-Pedersen (RUC), Sven Kesselring (AAU), Line Thorup (RUC), Enza Lissandrello (AAU), Aslak Aamot Kjærulff (RUC), Katrine Hartmann Petersen (RUC), Dorte Norgaard Madsen (AAU) and Birgitte Steen Hansen (RUC). From March 16-18 2012, the Communication, Rhetoric and Digital Media (CRDM) Program and the Mobile Gaming Research Lab at NC State University will be hosting the 3rd joint international conference of the Pan-American Mobilities Network and the Cosmobilities Network. Mobilities has become an important framework to understand and analyze contemporary social, spatial, economic and political practices. Being interdisciplinary in its nature, Mobilities focuses on the systematic movement of people, goods and information that ‚Äútravel‚Äù around the world in rates much higher (or much slower) than before. As such, mobility studies challenge traditional scholarship that often ignores the social dimensions of mobility, overlooking how travel, movement, and communication and transportation networks help to constitute modern societies and communities. Mobility has always been critical for the creation of social networks and to the development of connections to places. In addition, Mobilities contributes to study of the technological, social and cultural developments in transportation, border control, mobile communication, ‚Äúintelligent‚Äù infrastructure, surveillance. While mobility is an important framework to understand contemporary society, the pervasiveness of location-aware technology has made it possible to locate ourselves and be networked within patterns of mobility. As user generated maps and location-aware mobile devices become commonplace, we experience a shift in the way we connect to the internet and move through space. Networked interactions permeate our world. We no longer enter the internet–we carry it with us. We experience it while moving through physical spaces. Mobile phones, GPS receivers, and RFID tags are only a few examples of location-aware mobile technologies that mediate our interaction with networked spaces and influence how we move in these spaces. Increasingly, our physical location determines the types of information with which we interact, the way we move through physical spaces, and the people and things we find around us. These new kinds of networked interactions manifest in everyday social practices that are supported by the use of mobile and location-aware technologies, such as participation in location-based mobile games and social networks, use of location-based services, development of mobile annotation projects, and social mapping, just to name a few. The engagement with these practices has important implications for identity construction, our sense of privacy, our notions of place and space, civic and political participation, policy making, as well as cultural production and consumption in everyday life. ¬∑ New methodologies for mobilities research. Disciplines represented at the conference may include (but are not exclusive to): Anthropology, Architecture and Design, Civil and Environmental Engineering, Communication, Criminology, Cultural Studies, Geography, Media and Visual Arts, Politics and International Relations, Public Policy, Sociology, Theater and Performance Studies, Tourism Research, Transport Research, and Urban Studies. Discounted rates will be available to registered participants.